This classic Pineapple Lump Slice Recipe requires just a few ingredients, is easy to make and both regular and Thermomix instructions are included. 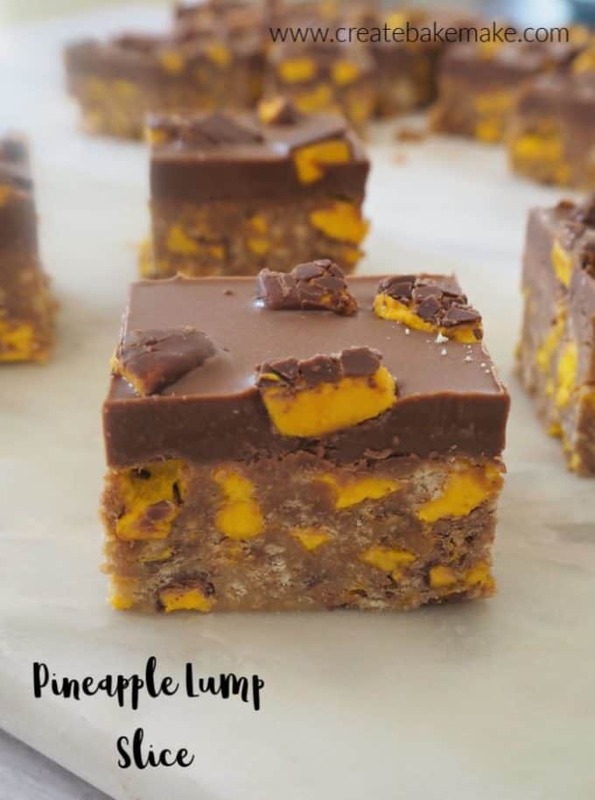 Classic slice recipes don’t get much better than this no bake Pineapple Lump Slice recipe, and they also don’t get much easier to make!! I first decided to make this Pineapple Lump Slice when I came across them on special at our local supermarket just before our school fete last year. Since then, I’ve made it several more times as my husband loves it! This recipe is based on my easy Clinkers Slice and I simply substituted the Clinkers for Pineapple Lumps – too easy! When you are putting this slice together, the mixture WILL be quite sticky. Please don’t worry though, as it will work out – I promise! I used two blocks of milk chocolate to cover the slice pictured, however you can use just one block of melted chocolate if you prefer. I also often get questions about why I add coconut oil to the chocolate and if it’s essential. I add it as it helps make the chocolate layer of the slice easier to cut, you can leave it out though if you prefer. This recipe makes approximately 24 pieces when you use a standard slice tin (24 x 18cm) however you can also make this slice in a 20 x 20cm square tin too, just make sure you cover the base and sides with baking paper to help you remove it once it has set! You can find more classic no bake slice recipes (with both regular and Thermomix instructions) in this post. You can also purchase your own copy of our No Bake Slices eBook here – also available in a Thermomix version and you can shop the full range of print and ebooks here. This classic No Bake Pineapple Lump Slice recipe is perfect for all occasions! Both regular and Thermomix instructions included. Line a 28x18cm slice tin with baking paper, making sure you leave plenty hanging over the edge to help you lift the slice out of the tin later. Crush the biscuits and Pineapple Lumps into large pieces using a food processor - a rolling pin will also work! Place the crushed biscuits and Pineapple Lumps into a large bowl and set aside. Pour the combined condensed milk and butter into the bowl with the crushed biscuits and Pineapple Lump pieces. Use a large metal spoon to mix together until combined. Don't worry, the mixture will be quite sticky. Pour the mixture into your lined baking tin and use the back of a metal spoon to spread it evenly across the tray and push down to create a flat surface. Break the milk chocolate into small pieces and place it along with the coconut oil into a microwave safe bowl. Cook for 30 sec spurts (stirring in between) until the chocolate has almost melted. Remove from the microwave and stir until completely melted. Pour the melted chocolate over the top of the slice and sprinkle the chopped Pineapple Lump pieces over the top. Place the slice into the fridge to set (preferably 3+ hours). This slice will keep in an airtight container in the fridge for up to 10 days. Place the Pineapple Lumps and biscuits into the Thermomix bowl and crush for 5 seconds on speed 3 or until they have broken into bite sized chunks. Pour the crushed Pineapple Lump pieces and biscuits into a large bowl and set aside until needed. Pour the combined condensed milk and butter into the bowl with the crushed biscuits and Pineapple Lump pieces. Use a large metal spoon to mix together. 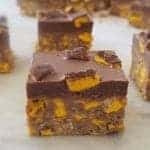 Pour the melted chocolate over the top of the slice and add the chopped up Pineapple Lump pieces before placing into the fridge to set (preferably 4+ hours). Where do u get the pineapple lumps from?